Carman Mennonite Church, July 2017. Carman Mennonite Church began services and organized in 1945. Mennonite families settled in the Carman, Manitoba area after the immigration movement in the 1920s and during the 1930s attempts were made by the Mennonite families to worship together. A group was officially organized as a Bergthaler group in 1945 and in 1954 it became a congregation. During these years a meeting house was completed and leadership was provided by the Bergthaler Lehrdienst and the Home Mission Board of the Conference of Mennonites in Canada. Until 1953 Carman was still considered a mission station of the Canadian conference. When it became a congregation it was known as the Graysville-Carman congregation. The leaders of the Graysville part of the group were Franz Letkemann and J. Janzen. In 1962 it became known as the Carman Bergthaler Mennonite Church. A larger meeting house was completed in 1982. Braun, Braun. "The Carman Mennonite Church, 1945-1985." Unpublished Research Paper, CMBC, 1985, 29 pp. Mennonite Heritage Centre. Epp, Marlene. "Carman Mennonite Church (Carman, Manitoba, Canada)." Global Anabaptist Mennonite Encyclopedia Online. September 1986. Web. 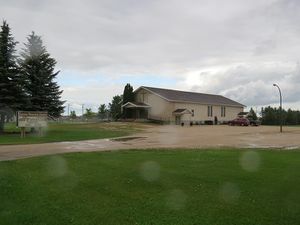 22 Apr 2019. http://gameo.org/index.php?title=Carman_Mennonite_Church_(Carman,_Manitoba,_Canada)&oldid=149079. Epp, Marlene. (September 1986). Carman Mennonite Church (Carman, Manitoba, Canada). Global Anabaptist Mennonite Encyclopedia Online. Retrieved 22 April 2019, from http://gameo.org/index.php?title=Carman_Mennonite_Church_(Carman,_Manitoba,_Canada)&oldid=149079. This page was last modified on 18 July 2017, at 17:03.